When I first started writing this blog I was more inclined to discuss heated political and social issues. Seems like as a nation we’ve become so polarized, so divided, so nasty (for lack of a better word) that I’ve tended to steer clear of things that inflame the senses of the various competing political and ethical camps. Maybe I was afraid of the repercussions. Maybe I was just tired of trying to explain simple positions. It does get old defending what seems to be the most pure and logical assertions from the barrage of criticism and fired up vitriol. Everyone has an axe to grind! Thus I have kept my comments and analysis to my gardening, sports and music. The recent controversy over the flying of the Confederate flag over state capitol buildings begs a comment or two. Honestly I never have understood why it was necessary to somehow glorify an obvious symbol of a long gone era. An era in which human beings were routinely bought and sold in a country that espoused freedom and liberty. It was a paradoxical time in the history of this great human experiment we call America. It was a time when many of the simple truths this country was founded on were being shaken to their very core. Ultimately many thousands of men would lose their lives over these fundamental issues and in the end the Union was preserved. Apparently there are many people in this modern era who have fostered an almost mythic reverence for the ways of the Old South, that in their eyes, has sadly been lost forever. The representatives of the southern states who have persisted in flying the flag (and their supporters) like to point out that their doing so is a simple homage to their brave ancestors who fought and died for their beliefs on the battlefield and not to glorify that world view. That would seem like a reasonable explanation but if one digs a bit further into the actual events of the time, and the comments made by the combatants as to the real reasons for the Civil War, it becomes crystal clear why the continued presence of this Confederate symbol on state grounds is such an affront to the African American community and many other people with a conscience. In his famous “Cornerstone Speech”, then Vice President of the Confederacy Alexander Stephens attempted to clear up any misunderstandings about what the Confederacy stood for and why the Civil War was inevitable. Accordinging to WIKIPEDIA, Stephen’sspeech explained what the fundamental differences were between the constitutions of the Confederacy and that of the United States, enumerated contrasts between U.S. and Confederate ideologies and beliefs, laid out the Confederacy’s causes for starting the American Civil War, and defended slavery. I’d like to thank my old and dear friend Paul “Broke” Brokaw for bringing this speech to my attention. Though I was a Civil War buff as a child, I guess I never fully grasped the magnitude of Stephen’s oratory until just these last few days. Stephens made this speech a few days after Lincoln was elected President. The Confederate flag therefore is the banner under which thousands of people fought and died to promote and defend this outmoded and universally rejected ideology. They were trying to reshape the world to perpetuate their own racist order. Can there be any more compelling reason to forever retire this symbol of white superiority to the museum case and eliminate it’s presence from the halls of state governments? It has been said that if American slavery had existed, and the Civil War and been fought 1000 years ago, then perhaps the pain and suffering of those many innocents would be a distant and detached history lesson, dulled by the passing of time. That is simply not the case. In the discourse of the 21st century there many citizens who have had grandparents and great grandparents who were the victims of the crime of slavery. Must we continue to fly a flag that serves toremind them of a time when they were considered no more than property? To be bought and sold like cattle? Removing the Confederate flag from government should not be seen as a political battle between the left and right but rather as a move toward greater understanding of all our people’s feelings. It’s a step towards bringing greater decency to our society and healing some of the wounds that still remain after 150 years. This entry was posted in Politics, Pop culture and tagged 19th century, American Civil War, Confederate States of America, Flags of the Confederate States of America, Union (American Civil War). Bookmark the permalink. Welcome back. 🙂 This was a great blog on a very contemporary issue (despite its ancient, dubious history), and I’m glad to see you address current events again. I’ve read all your blogposts, and consider you an expert on all things gardening and sports and music, but I guess I’m one of your readers who prefers to engage in more controversial issues. I don’t run a blog myself, so I can imagine it gets tiring when various trolls try to get a rise out of people. I don’t know what I would do myself. First, we tend to forget that Africans were literally captured in their homeland, separated from their wives, children, extended families and loved ones, and transported to a completely foreign soil, so that American plantation owners could use them and abuse them as free labor to enrich them. Can you imagine? Second, this was never an official flag. It was the flag of a rogue group of people who wanted to unconstitutionally secede from the union so that they could continue to subjugate an entire race of people. Discrimination and hate, plain and simple. Bigotry by any other word is still bigotry. 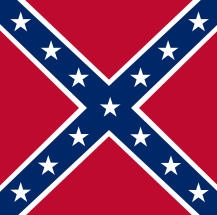 This is not a symbol of Southern pride. I lived in the South for 35 years, and found it had a lot of charms, between the food, architecture, and sometimes even the accents. (Sometimes.) The American South doesn’t need a flag to show that or prove that. Does the North have its own flag? Or the American West? No. I am so happy that SC decided to remove the flag by tomorrow morning — although I would have been happier if it had been taken down before the public viewing for State Sen. Clementine Pinckney, who was among the nine murdered in Mother AME. It seems that the impetus in doing so was the very impassioned speech of Jerry Horne of the SC House. Even as a descendant of Jefferson Davis (so-called “president of the Confederacy”), she found the flag and what it represents to be repulsive to American ideals — and she articulated it well. Her choked-up, teary-eyed speech made me quite emotional. It also made me feel that the way she handled this issue — which really caused the vote to go the right way — also showed that women have an important place in politics. We need more of their emotion in dealing with issues. Sometimes I am truly amazed by the silly BS that Americans perpetrate upon one another. Yesterday SC took down it’s confederate flag. I guess the war is over there, at least temporarily! Thanks for your input. Concise and literate as usual.